Tob1, a Tob/BTG anti-proliferative protein family member, functions as a tumour suppressor in many cancers. Here, we reveal a unique oncogenic role of Tob1 in colon cancer. Tob1 expression was upregulated during colon cancer progression, was significantly correlated with tumour size and tumour differentiation, and was a prognostic indicator of colon cancer. Unlike in other cancers, where nuclear Tob1 performs anticancer activity, Tob1 is predominantly localized in the cytosol of colon cancer cells, where this protein binds and stabilizes β-catenin to activate Wnt/β-catenin signalling, which in turn enhances Tob1 expression, thus forming a positive feedback loop to promote cell proliferation. Moreover, Tob1 deficiency led to reduced tumourigenesis in AOM/DSS-treated and ApcMin/+ mice. Our findings provide important insights into a previously unrecognized oncogenic role of Tob1 in colon cancer and suggest that Tob1 is an adverse prognostic factor and therapeutic target for colon cancer. 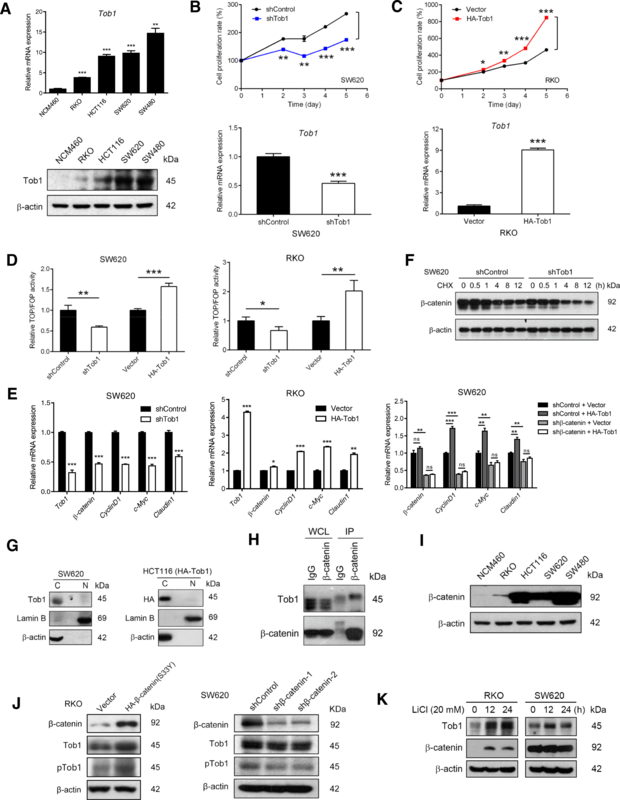 Tob1, a Tob/BTG anti-proliferative protein family member, acts as a tumour suppressor in many cancers [1–3], though it might have oncogenic role in estrogen-independent ER-positive breast cancer cells . In colon cancer cells, Tob1 was simply reported to be upregulated by EZH2 depletion . In this study, we unexpectedly found that Tob1 acts as an oncogenic protein in colon cancer via a Wnt positive feedback loop. The Oncomine database  was analysed to compare Tob1 DNA and mRNA levels between colon cancer and normal tissues. The Kurashina and TCGA colorectal-2 datasets showed increased Tob1 DNA copies in colon cancer (Additional file 1: Table S1). Kaiser’s datasets showed that Tob1 mRNA levels were significantly elevated in colon adenocarcinoma (Fig. 1A). Tob1 mRNA (Additional file 1: Figure S1A-B) and protein (Fig. 1B-C) levels were upregulated in colon cancer tissues compared to paired noncancerous tissues; however, Tob1 phosphorylation  did not differ between tumour and non-tumour tissues when normalized to Tob1 expression (Additional file 1: Figure S2). Tissue Microarray analysis of 84 colon cancer samples confirmed that Tob1 expression was significantly higher in colon cancer than in normal tissues (P < 0. 001, Fig. 1D-E). Tob1 was mainly localized in the cytoplasm of both normal colonic epithelial and colon cancer cells (Fig. 1D), unlike the localization observed in other kinds of cancers or normal tissues [1–3]. ROC curve analysis provided the AUC (0.886) and IHC cut-off score (1.5) of Tob1 to distinguish colon cancer from normal tissues (P < 0.001, Fig. 1F). The point on the curve was close to (0.0, 1.0), maximizing both sensitivity (97.6%) and specificity (71.4%). Additional file 1: Table S2 shows that high Tob1 expression was significantly associated with tumour size (P = 0.035) and tumour differentiation (P = 0.000). Kaplan-Meier analysis of the mean OS showed reduced survival in patients with high Tob1 expression (55.0 months) compared to those with low Tob1 expression (82.1 months) (P = 0.029, Fig. 1G). Univariate analysis indicated that Tob1 expression, TNM stage, lymphatic metastasis and tumour size were significant prognostic factors for OS (Additional file 1: Table S3). Nevertheless, Tob1 expression was not an independent prognostic factor for OS in multivariate analysis. A longer OS was also observed in stage I-II colon cancer patients with low Tob1 expression than in those with high Tob1 expression (P = 0.023, Fig. 1H). Univariate and multivariate analyses showed that Tob1 expression (P = 0.012) and lymphovascular invasion (P = 0.003) were independent prognostic indicators for OS in stage I-II colon cancer patients (Additional file 1: Table S4). Because Tob1 expression was associated with tumour size but not tumour invasion depth or lymph node metastasis, we analysed the involvement of Tob1 in colon cancer cell growth. The mRNA and protein levels, but not phosphorylation (normalized to expression), of Tob1 were much higher in colon cancer cells than in normal colonic epithelial NCM460 cells (Fig. 2a & Additional file 1: Figure S3). Tob1 knockdown dramatically decreased the growth of high-Tob1-expressing SW620 cells, while overexpression of Tob1 significantly promoted the proliferation of low-Tob1-expressing RKO cells (Fig. 2b-c), indicating a role for Tob1 in the promotion of colon cancer cell growth. Due to the pivotal role of dysregulated Wnt/β-catenin signalling in colon cancer development , we asked whether this pathway contributes to the effect of Tob1 on colon cancer. Tob1 knockdown significantly inhibited and Tob1 overexpression greatly enhanced β-catenin-dependent transcriptional activity in SW620 and RKO cells, respectively (Fig. 2d). Moreover, the mRNA levels of Cyclin D1, c-Myc and Claudin1, important Wnt/β-catenin target genes to regulate cell proliferation, changed significantly with Tob1 expression in SW620 and RKO cells in a β-catenin-dependent manner (Fig. 2e). We then investigated the modulation of β-catenin signalling by Tob1. Given that the turnover of cytoplasmic β-catenin is a central event , we tested whether Tob1 could influence β-catenin stability. As expected, Tob1 knockdown led to rapid degradation of β-catenin under CHX treatment in SW620 cells (Fig. 2f). To understand how Tob1 stabilized β-catenin, the unique cytoplasmic location observed in Fig. 1D was confirmed in SW620 and HCT116 cells (Fig. 2g). We found that Tob1 interacted with β-catenin in RKO cells expressing high levels of β-catenin due to pre-treatment with the GSK3 inhibitor CHIR99021 (6 μM, 24 h) (Fig. 2h). These results suggested that Tob1 interacts with β-catenin in the cytoplasm and increases β-catenin stability, thereby upregulating β-catenin signalling and promoting colon cancer cell growth. We then explored whether hyperactive Wnt signalling in colon cancer  inversely contributed to upregulated Tob1 expression. β-Catenin expression was correlated with Tob1 expression in four colon cancer cell lines (Fig. 2a, Fig. 2i). Moreover, β-catenin overexpression elevated and β-catenin knockdown reduced Tob1 expression in RKO and SW620 cells, respectively (Fig. 2j). Tob1 expression was also upregulated by LiCl-induced activation of Wnt/β-catenin signalling in RKO cells but not SW620 cells, which are unable to respond to LiCl owing to APC mutation  (Fig. 2k). Tob1 phosphorylation, when normalized to expression, was not noticeably changed by modulation of β-catenin levels in RKO and SW620 cells (Fig. 2j & Additional file 1: Figure S4). The above patterns suggest a positive feedback loop between Tob1 expression and Wnt signalling in the progression of colon cancer. Tob1 knockdown was further performed in two mouse models of colon cancer—a drug-induced model (AOM/DSS treatment) and gene-disrupted model (ApcMin/+)—to explore the role of Tob1 in vivo. After 3 rounds of DSS exposure following AOM injection (Fig. 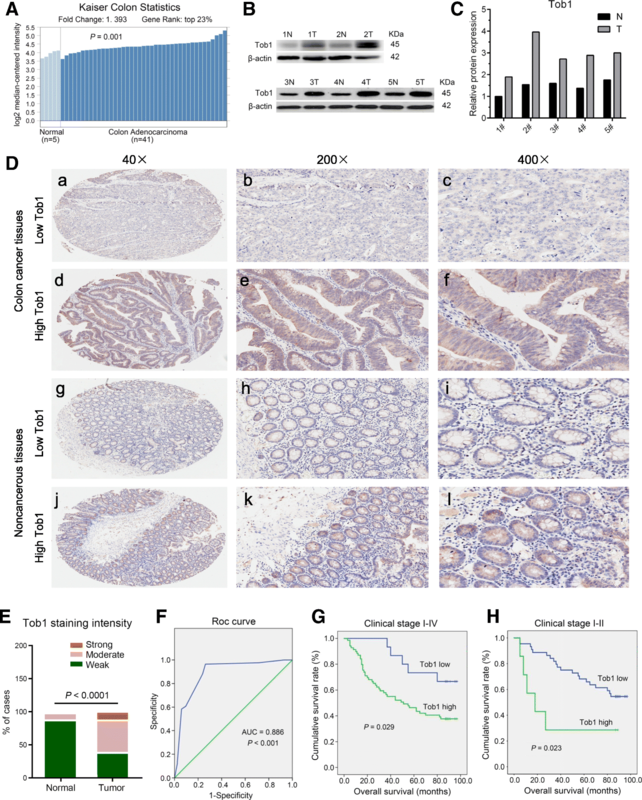 3a), Tob1−/− and Tob1+/+ mice exhibited 100% incidence of colon tumour development, and Tob1−/− mouse colons exhibited fewer AOM/DSS-induced tumours than Tob1+/+ mouse colons (Fig. 3b-d). Tob1 deficiency resulted in reduced cell proliferation, based on the levels of Ki67 and PHH3, two markers of cell proliferation. In addition, the downstream target protein of the Wnt signalling pathway, cyclin D1, was also repressed in the absence of Tob1 (Fig. 3e). Consistent with this finding, colorectal tumours in Tob1−/−, ApcMin/+ mice had the lowest malignant tendencies among these three groups, while Tob1+/+, ApcMin/+ mice developed the most malignant tumours (Fig. 3f). In situ hybridization analysis further indicated upregulation of Tob1 expression in ApcMin/+ mice with overactivated Wnt signalling pathways (Fig. 3g). 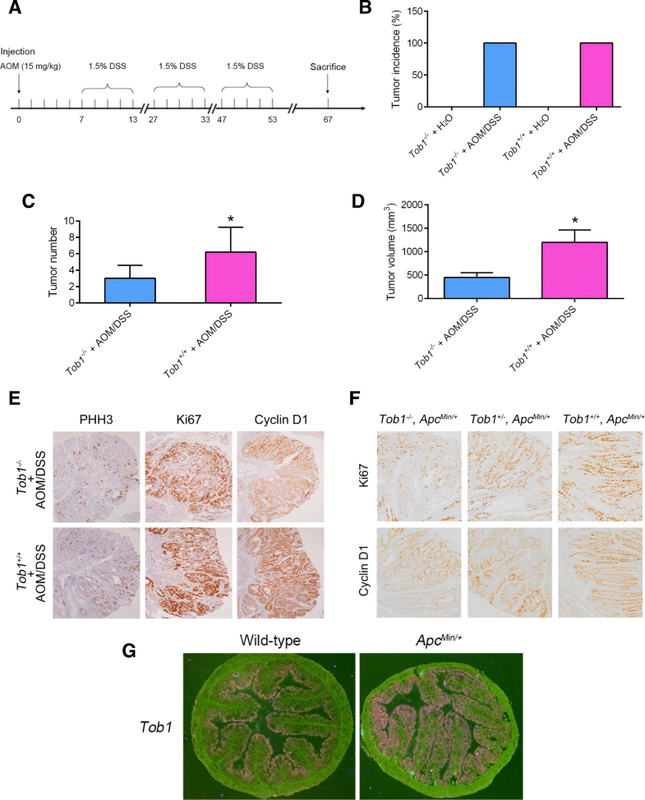 These in vivo results were consistent with the in vitro results, indicating that Tob1 and Wnt signalling are mutually regulated to promote colon cancer development. Here, we identified a unique oncogenic role of Tob1 as an adverse prognostic factor for colon cancer, where Tob1 is localized mainly in the cytosol and promotes cell growth via a Wnt positive feedback loop. Dandan Li and Li Xiao contributed equally to this work. This work was supported by the National Natural Science Foundation of China, No. 81472568 (to T.H. ), U1405228 (to T.H. ), 31770860 (To T.H.) and 81572589 (to Y.-Y.Z. ); the Natural Science Foundation of Fujian Province, No. 2017 J06020 (to Y.-Y.Z. ), 2017R1036-4 (to Y.-Y.Z. ), 2016R1034-4 (to W.Z. ), 2016R1034-1 (to H.C.), 2017R1036-6 (to B.C.) and 2018 J01400 (to L.X. ), and the Health and young middle-aged of personnel training project funding of Fujian Province No. 2016-ZQN-89 (to L.X.). Additional file 1 was available online. Concept and design: HW, YZ, TH; Performing experiments: DL, LX, YG, YF, BC; Analysis of data: DL, LX; Contributing reagents, materials and other analytical tools: YG, WZ, HC; Writing the manuscript: TH, YZ, LX. All authors read and approved the final manuscript. A total of 109 specimens from colon cancer patients were used for this study, which was approved by the Medical Ethics Committee of Zhongshan Hospital Affiliated to Xiamen University in accordance with the Helsinki Declaration and conducted with the informed consent of all patients. All animals were performed in accordance with a protocol approved by the Animal Care and Use Committee of Xiamen University.